Johannes Ledolter, "Data Mining and Business Analytics with R"
Collecting, analyzing, and extracting valuable information from a large amount of data requires easily accessible, robust, computational and analytical tools. 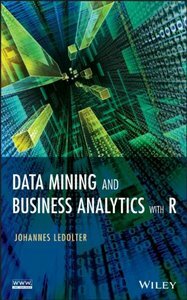 Data Mining and Business Analytics with R utilizes the open source software R for the analysis, exploration, and simplification of large high–dimensional data sets. As a result, readers are provided with the needed guidance to model and interpret complicated data and become adept at building powerful models for prediction and classification. Highlighting both underlying concepts and practical computational skills, Data Mining and Business Analytics with R begins with coverage of standard linear regression and the importance of parsimony in statistical modeling. The book includes important topics such as penalty–based variable selection (LASSO); logistic regression; regression and classification trees; clustering; principal components and partial least squares; and the analysis of text and network data. In addition, the book presents: • A thorough discussion and extensive demonstration of the theory behind the most useful data mining tools • Illustrations of how to use the outlined concepts in real–world situations • Readily available additional data sets and related R code allowing readers to apply their own analyses to the discussed materials • Numerous exercises to help readers with computing skills and deepen their understanding of the material Data Mining and Business Analytics with R is an excellent graduate–level textbook for courses on data mining and business analytics. The book is also a valuable reference for practitioners who collect and analyze data in the fields of finance, operations management, marketing, and the information sciences.